Britannia Safety Training is the leading UK safety training provider for the commercial industry with facilities situated near Norwich, Norfolk. As you book your training, we know that the experience of the people training you, the facilities on hand and the approach to training all matter a great deal. We have worked hard to create the perfect environment for training – from our spacious and welcoming training rooms, with the very latest technology, to our catering facilities and refreshments throughout the day. We’re committed to making sure that the course you require is the course you receive, so as you book, we recommend that you speak to one of our team. We have instilled ‘old fashioned values’ of customer services, and you’ll find every one of the Britannia team friendly and happy to help. Here at Britannia, our aim is to keep everyone safe. Our Emergency courses range from a fully accredited 3 day First Aid course and a one day Emergency First Aid course, Legionella awareness, fire safety to Sharps & Needle training. Most of our management courses are nationally accredited to bodies such as NEBOSH, IOSH and CSKILLS. Some of the training can be bespoke to your specific needs and some will have set programme’s to be followed. The use of plant & equipment in the workplace is covered by PUWER (1998) and LOLER (1998) legislation. We run onsite and offsite courses which meet these legislations both in house and to the nationally accredited RTITB status. The work at height regulations were introduced in 2005 and the aim was to reduce the number of deaths from one area within the general workplace. All of our courses are nationally accredited such as IPAF, CISRS, PASMA and LMA. Whatever you do in the workplace there is a requirement to be competent and have suitable experience & skills to do the job or task. All of our in-house courses can be made bespoke to your company needs but will be covered under the Health & Safety at work act 1974. Our Training Courses and Facilities are renowned as some of the best in the business. With a regular variety of courses taking place, daily we aim to accommodate all shapes and sizes of business. 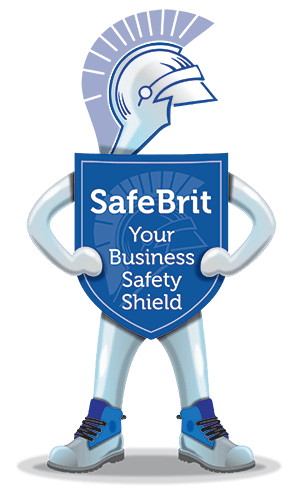 Britannia Safety & Training are pleased to introduce SafeBrit Brian your Health & Safety Shield. To find out more about our SafeBrit Health & Safety Consultancy service please visit our new consultancy website SafeBrit.co.uk.